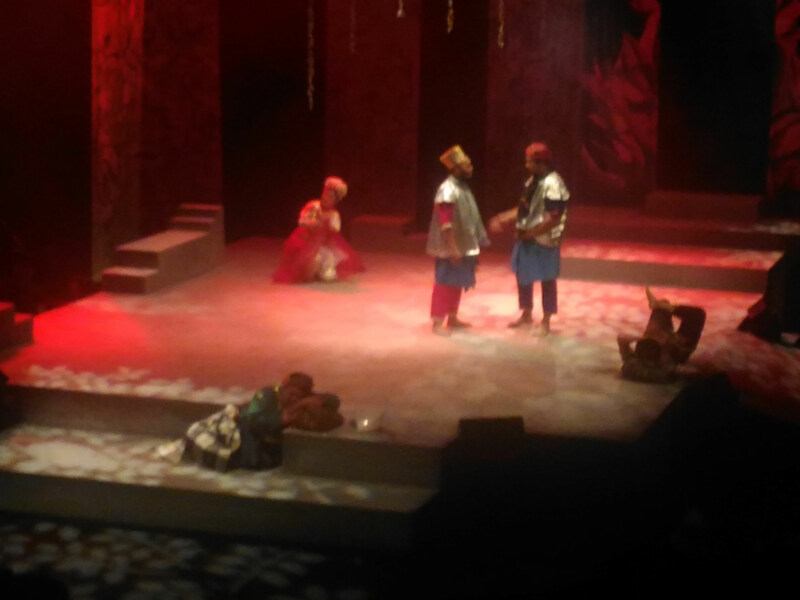 We forced a theatre newbie to watch a Shakespearean Mak Yong play. Here’s his review. Hello there. My name is Raymond and I know almost nothing about theater and stage productions. I’m turning 22 this year and I’ve only ever watched one play, Lo Mio and Chiu Liet in 2016. To put it briefly, a bottle of Yakult literally has more culture than me. As such, based on my non-existent “flair” for the stage, the editor thought it’d be interesting for me to review Mak Yong Titis Sakti. There was only one condition – I wasn’t allowed to do any research about Mak Yong or the show itself. The only information I had about the show before entering Klpac’s Pentas 1 was whatever was stated on the poster. So I guess I’ll be starting the review with the poster. Now I’m not gonna lie, when I first saw the title, I thought it was a play featuring a elderly Malay woman named Mak Yong who discovers that her tears have powers… you can stop judging me now. Having watched the play myself (and googled ‘mak yong’) however, I now know what the term Mak Yong refers to: a form of dance-drama that originated from pre-Islamic Kelantan. You can read more about Mak Yong and its controversial status in Malaysia here, but for the purposes of this review, I’m gonna focus on the play itself. The King of a forest comes across a bickering couple, and decides to help, so he sends his servants and a bomoh to use magic rituals involving drops of flower essence (hence the titular ‘titis sakti’) to try and make the couple fall in love each other. However, the servants accidentally mess up the rituals, performing the ritual on the wrong couple instead. What follows is a love triangle rectangle of comedic proportions, as the servants continue to try and fix their errors, while the two couples get entangled with each other. There’s also an over protective dad who adds fuel to the flame as he tries to stop his daughter marrying a man he doesn’t like. There were also a few scenes of song and dance in a traditional Malay fashion, which almost seemed like a slow-mo Kpop girl group but more impressive and less manufactured. Fight me Kpop fans. I found out later that the story is based on Shakespeare’s A Midsummer’s Night Dream, which doesn’t really change anything because I don’t know what that is. Personally, my favorite scenes from Mak Yong Titis Sakti were the ones with the servants. The humor going on between them was funny and quite understandable. The two servants (in silver) mid-scene. No Shakespearean jokes here. Instead I found a solid mix of slapstick and and modern cultural references, such as Saudi donations, ‘Ossas‘ and LGBT (apparently it means Lelaki Gila Berwawasan Terkini). The running gag of Cempaka Sari’s father running in at the wrong times was also a nice addition to the seriousness of the scenes. I will not say I understood everything that was said on stage though, as the thick Northern Malay accent took some time to get used to. However, scene descriptions in English along with the solid performance of the actors meant that I generally could make out what was going on without too much of a hassle. Despite the language barriers, I thoroughly enjoyed the show and its combination of forbidden love, traditional Malay culture and humor that was going on. While I can’t see everyone enjoying this show, Mak Yong Titis Sakti would definitely impress you if you come with an open mind (and maybe someone who understands the accent). Mak Yong performances don’t happen very often mind you, so if you do want to come see Mak Yong Titis Sakti you can get tickets online by clicking here or by calling the Klpac Box Office at +603-4047 9000. It’s a solid 8/10 from me. I was part of a theatre show in klpac. Plot twist – we opened on GE14.